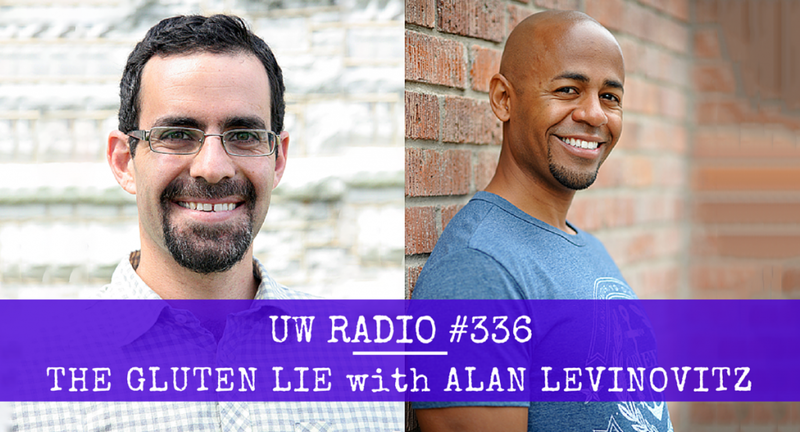 Alan Levinovitz stops by the podcast to discuss his controversial book The Gluten Lie and Other Myths About What You Eat. 3:25 – Why a philosopher and religion professor wrote a nutrition book and how food and religion have more in common than you might think! 8:15 – Are modern times really so bad? The myth of paradise past and how food technologies might be helping us more than they hurt. 11:15 – What paleo is, what it isn’t, and why “eat in moderation” doesn’t work. 12:50 – Where is the science? Why it’s so hard to get clear evidence on food and nutrition and whether or not we’ll ever have any answers. 19:25 – Science vs. sensationalism: mis-reporting in the media and what the scientists really have to say about their nutrition studies. 24:48 – Is it really just the gluten? The real reasons people might feel better off gluten and how to figure out if it will make you feel better, too. 28:44 – All about the nocebo effect and how your mind might be a bigger problem than the gluten. 33:15 – When “too healthy” becomes unhealthy and why we sometimes stick with something that doesn’t really work for us anymore. 38:05 – The problem with getting ahead of the scientific evidence. Plus, why the truth about food and nutrition probably isn’t as exciting as some people would lead us to believe. 50:30 – The money and marketing behind nutrition: figuring out who really has your best interest at heart and why being an equal opportunity skeptic might be good for your health. 56:19 – Are we addicted to health? What holistic health really is, How Alan finds balance in his own life, and what he’s up to next! #335 – The Serotonin Myth? Licensed psychiatrist Dr. Kelly Brogan states a compelling case for why Depression is NOT a Serotonin Deficiency. Discover what she calls the “flawed logic” in our current understanding of how antidepressants work. And, learn what the science really says about these drugs. 3:03 – How the monoamine hypothesis of depression got started and why its logic is flawed. 7:23 – What is a normal brain anyway? How serotonin levels may or may not be a factor in depression. 10:39 – Antidepressant adaptation: what happens to your brain and your body when you take (or stop taking!) an antidepressant. 15:29 – What the studies REALLY say about antidepressant medications and the profound power of placebo. 22:45 – Does time heal all? How treatment could be turning some problems into big ones, when “doing nothing” might be the best treatment of all, and why Dr. Brogan does not prescribe medications to her patients. 30:32 – How one major study showed antidepressant medications might not work the way we think they do and why nobody is talking about it. 35:37 – Could the effects of antidepressants really just be anti-inflammatory? All about the cytokine theory of depression and sickness syndrome. 42:44 – Dr. Brogan’s best tips for reducing inflammation with food and lifestyle changes. Plus, real life patient stories of how they work. 50:38 What the cytokine model of depression means for Big Pharma … and for the people taking their medications. Click the PLAY button below to listen to the entire episode. * Why there’s more to correcting mood disorders than just boosting neurotransmitter levels with amino acid supplements. A lot more! * Why traumatic brain injuries often show up as depression … years down the road. * How chronic gut inflammation can cause brain inflammation, leading to depression. * What the “other symptoms” presenting with depression (anxiety, insomnia, blood sugar problems, and brain fog) can reveal about its cause. The Depression Sessions are just around the corner. Today, I share 14 of my favorite clips from our hand-picked panel of presenters. 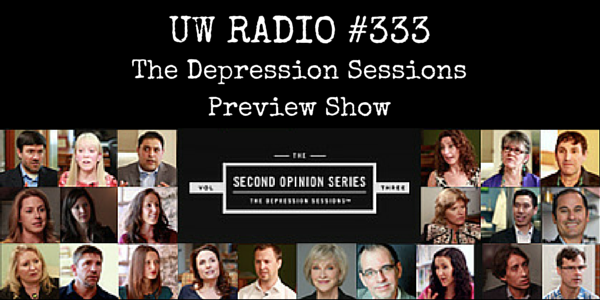 1:10 – All about The Depression Sessions and why you should sign up NOW! 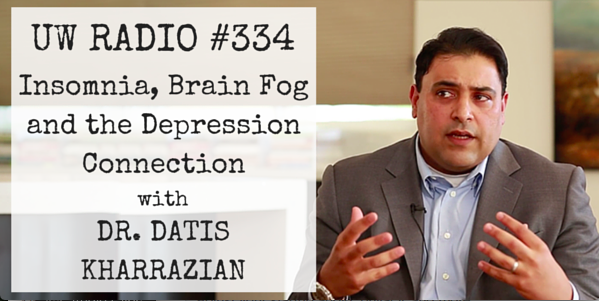 2:48 – Are you a “flatliner?” Dr. Datis Kharrazian talks about an often overlooked cause of depression. 7:08 – Why is your serotonin low in the first place? Tom Malterre tells us what might be going on in our bodies. 12:43 – Is it in the genes? Dr. Ben Lynch explains why some people might be burning through serotonin like crazy … and why you might want to put down the 5-HTP. 16:44 – Can you rewire your brain? How to overcome depression with Neurofeedback from Nora Gedgaudas. 20:05 – What we can learn from studying floating mice and valium-like bacteria! Dr. Jill Carnahan gives us the details on stress and our gut. 23:17 – Can depression just go away on it’s own? Dr. Dan Kalish tells us why some people are better off NOT taking a drug. 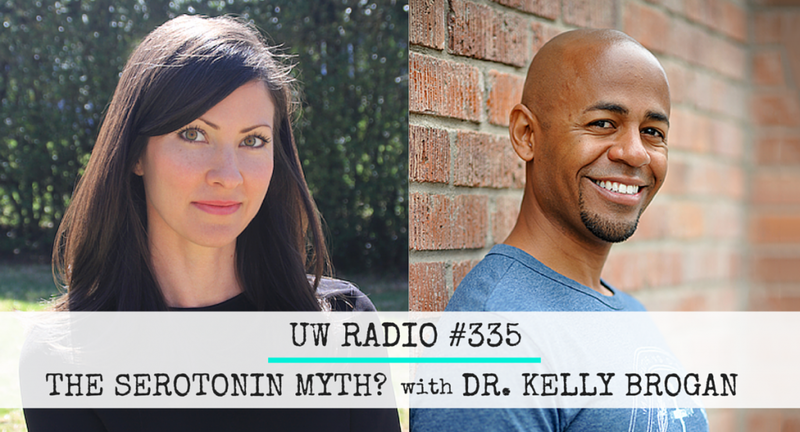 26:08 – What the research really says about antidepressant drugs and what might really be the reason people feel better from Dr. Kelly Brogan. 32:51 – The Gift of Depression: How to listen to what your depression is telling you with Marc David. 38:36 – Why isn’t any of this taught in medical schools? Dr. Ann Childers gives us her take on the pharmaceutical industry’s power in doctor’s educations. 41:58 – Is the low-fat craze to blame? Gerald Roliz lets us know why we need fat and what it has to do with depression. 44:27 – Trudy Scott tells us why we might owe red meat an apology and how it can even help improve your mood! 46:33 – SSRI addiction: What’s really going on in your brain when you take a serotonin re-uptake inhibitor and what you can do to help yourself get off them with Dr. Jillian Teta. 50:21 – The hormone-depression connection: Dr. Hyla Cass and Alisa Vitti give us need to know info about hormone and mood management. 55:41 – What else to expect during The Depression Sessions including how to get registered for the event and get lifetime access to all 22 interviews! 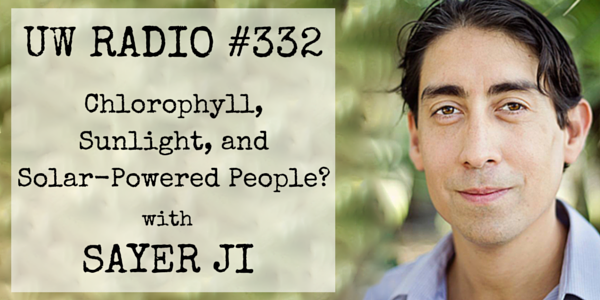 #332 – Sunlight, Chlorophyll, and Solar-Powered People? Sayer Ji, founder of GreenMedInfo, reveals a new paradigm in human energy production. Can humans derive energy from sunlight? 4:03 – The process of finding credible info and how to become a better researcher. 9:15 – Biology 101! How we might be more like plants than we originally thought. 13:30 – Evolution and energy: why it’s only common sense that we can use sunlight for energy and why it might even be better for our bodies to do so. 20:18 – Hairless humans: The evolutionary side of losing our hair to capture more light and energy from the sun. 26:16 – The many sides of melanin and skin pigment. 29:50 – Can we live without food? Pseudo-science versus significant studies. 34:16 – Why you should eat more greens … no matter what type of diet you eat. 36:26 – Recommendations for sunlight exposure. The best times to be in the sun and what to eat for the best benefits. 39:04 – Are we being unfair to the food? When the benefits of food outweigh the burden of naturally occurring toxins and why it’s never just about energy. 44:45 – How to get more awesome information from Sayer Ji! 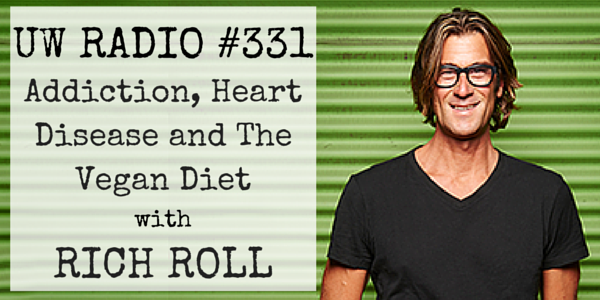 Rich Roll, co-author of The Plantpower Way and host of The Rich Roll Podcast, stops by to share his incredible story of overcoming alcoholism and food addiction, and how he transformed himself into one of the fittest people on the planet. 3:08 – How Rich went from being awkward, insecure little guy picked last for kickball to an alcoholic attorney headed towards death or jail. 13:55 – Rich spends his 30s sober, medicating with work, food and the Window Diet until he finally gets a reality check to make a change. 18:59 – The first thing Rich did to turn things around and how he “accidentally” got to a plant based diet. 22:49 – Debunking the debunking of The China Study: it’s influence on Rich’s new lifestyle and what he thinks we can take away from the book. 28:44 – Can an old school food cause brand new disease? Why these issues are much more complicated than we’d like to believe and how we can start to simplify it so people aren’t so confused about what to eat. 38:34 – Taking personal power and responsibility for your health and how to really figure out the best diet for you. 40:20 – Will giving up animal products alone make you immune to disease? How to avoid being a junk vegetarian or vegan. 43:25 – How Rich tested the resiliency of the human body with five Iron Man competitions in one week! 48:42 – The big difference between training for performance and training for longevity and why Rich’s participation in endurance events is more about his soul than it is about his body. 56:03 – Addictions and extreme personalities: some wise words on what we can all do to keep ourselves in check and make choices that will lead us to becoming better versions of ourselves. 59:49 – All about The Plantpower Way and Rich’s podcast. 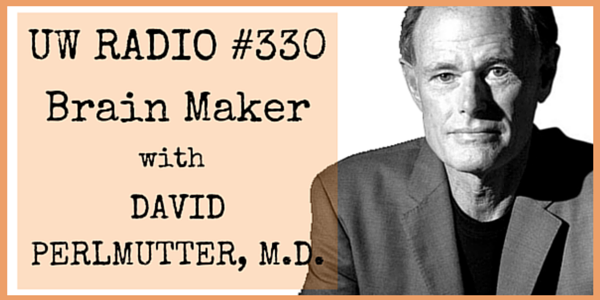 Dr. David Perlmutter — author of Brain Maker: The Power of Gut Microbes to Heal and Protect Your Brain for Life — returns to the podcast to reveal shocking research on the role of gut bacteria in depression, ADHD, Alzheimer’s, and autism. 2:27 – A disaster for medicine? The big problem with looking at the body as different, separate parts and thinking of bacteria as a problem. 6:36 – It all starts in the gut. The set-point of inflammation, the long list of diseases associated with it and why treatments for them don’t always work. 12:35 – What does an optimal microbiome even look like? 14:54 – The power of dirt and how our obsession with “dangerous” germs could be doing us more harm than good. 17:47 – The importance of diversity in the gut and a few things you can do to help your gut help your body. 22:05 – The 3 important brain chemicals your gut makes to keep you healthy. Plus, more evidence for the gut-brain axis and how you can use it as a powerful approach for treating some major disorders. 29:46 – What’s really behind depression and anxiety? The link between gut health and mental health. 39:11 – Some awesome studies about more ways our gut impacts our lives…and can even change your perception of the world around you! 42:31 – Is gut trouble the root cause of ADHD and Autism? How treating the smoke and ignoring the fire is getting us into trouble and some new ideas from science about curing these conditions. 53:17 – Will we ever see widespread support for probiotics and nutritional supplements? Dr. Perlmutter gives us his take.